The froth spills over the side of the glass and your mouth immediately begins to water for the refreshing sip of your favorite beer. Admittedly, it’s the most pleasurable moment of the entire day, the period when you can really focus on yourself for some much-needed personal reflection. It’s what you look forward to and dream about during times when you need something extra to get you over life’s little humps and why shouldn’t you treat yourself well after all? For those who love beer, they typically adore each and every characteristic of the beverage including the smell, taste and eye appeal, which may give feelings of instant relaxation and utter satisfaction. There are even circumstances when it has been recorded that the sounds of a beer being poured into a glass can actually lower a person’s blood pressure, thus acting as a therapy tool. Yes, beer enthusiasts celebrate every aspect of the hop inspired treat and are typically well versed in the extent of consuming the benefits. 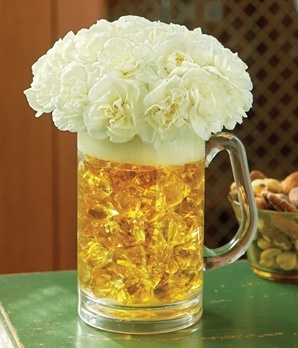 If you are a beer lover who also happens to like flowers, too, you might be interested in the strong trend of filling mugs with attractive seasonal blossoms. Sound crazy? Well in all honesty, these small arrangements are really quite adorable and serve dual purposes for all purchasing customers. 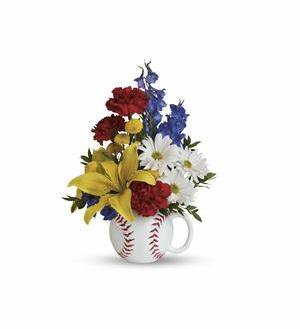 Not only are the bouquets relatively inexpensive (depending on the varieties used), they are also wonderful when implemented as props for sporting events, graduations and even weddings. Another reason to get on board with this popular way to display blooms is the fact that these containers are generally easy to find and low in cost unless finer substitutes of materials are desired. If simple glass is A-Okay with you, all you have to do next is insert small stems of whatever flowers you choose to make a truly beautiful yet affordable arrangement! Make them as traditional or dramatic as you wish and have fun creating the perfect floral presentation to gaze upon while you enjoy your adult beverage. If you want to authenticate the piece further, browse these species which reflect similar hues as you might compare to the drink. It’s your child’s big day and you’re in the heat of planning the perfect birthday celebration for twenty to thirty friends without a clue as of how to do it. Don’t worry- there’s an easy and fun way to create the ideal celebratory extravaganza that will fit your budget as well as put the “Wow” factor on the faces of guests. How do you start? Well, contrary to popular belief, not all parties for small children have to have a set theme. Clifford, Smurfs and My Little Pony topics can be incredibly detail oriented that can become overwhelming and impossible to afford on a tight budget. Give yourself a break and allow yourself a bit of wiggle room by opting for streamers balloons and lots and lots of flowers! Whether you have a special birthday girl or boy, use these tips to work with a local florist to create an age appropriate blooming presentation that will set the festivities off with a bang. Choose to navigate the task by implementing these tips for boys and girls or mix and match the colors any way that you want. Remember, birthday fun starts with cheery ideas and joyous accessories, so don’t be afraid to use your imagination and go for it. Quite often, we associate the color pink for girls but there’s other options available if you feel limited to this hue. Lavender, purple, chartreuse, peach, lime green and yellow are also feminine in nature and are stunning when two or more are arranged together. Ideal varieties may include ranunculus, hybrid delphinium, anemones, calla lilies, gerbera daisies, forsythia and tulips.You can even incorporate a jelly bean filled vase for the festivities. Just because it’s a boy’s birthday party, it doesn’t mean that you should forget the idea of using flowers as part of the décor. 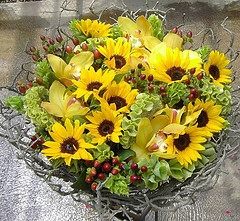 Many blooms can be very masculine such as delphinium, geraniums, calla lilies, orchids, roses and sunflowers. Colors that work well for this occasion include maroon, white, blue, red, green, bright yellow and orange. You can either choose one of these shades or blend together a few flavors to brighten up the room where your party is to be held. If your hesitant about this idea, grab some truck, sports balls or Lego containers (works well for girls, too) and use these as the flower holders. 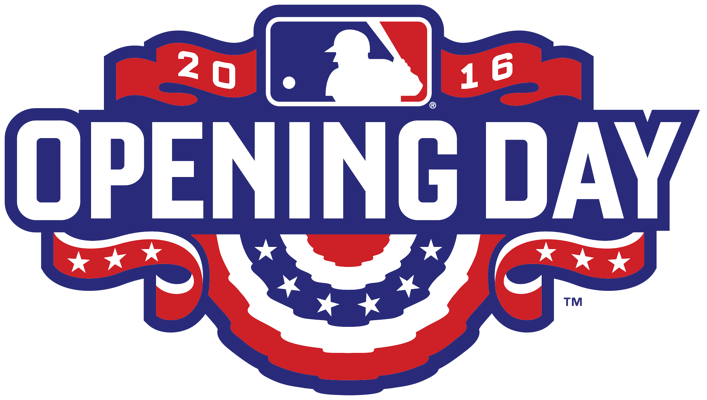 Spring is finally here and that means opening day at Fenway Park is just around the corner! Popcorn, cracker jacks, hot dogs, peanuts, foam fingers and baseball caps will be sold by the millions inside the park but Bostonians are also gearing up to make their own plans… Team spirit runs rampant during this time of year in Bean Town, where fans are throwing parties thematic after our love for the Boston Red Sox. Everything from the color scheme to the menu can be manipulated to include clever accessories and entertaining display décor. All you have to do is use a little imagination and think “Baseball”! Monday, April 11th is the official date when Fenway will be reopened to play a little ball against the Baltimore Orioles so why not have a few friends over to enjoy the game? Here are a few party planning ideas fabulous for opening day soiree! You’ve got to have a lot of finger foods if you’re having a fete mirrored after the cuisine served inside Fenway and the good news is that most of these dishes are really inexpensive to make. Think pigs in a blanket, popcorn, sliders, chips, dips and pizza. You can also have a little fun with veggie and fruit platters if you arrange the food to look like a baseball diamond or even an outfield. Don’t forget the dessert either, because a quick batch of cupcakes decorated with the letter “R” in blue and red frosting are the perfect sweet treats to compliment game day! This is really simple because right about now, every grocery store in Massachusetts is stocking up with paper and plastic Red Sox dishware and cups. If you don’t want to pay the extra to have their logo printed across your plates, just pick up plain white, red and blue Dixie brand ware, which works just as well. 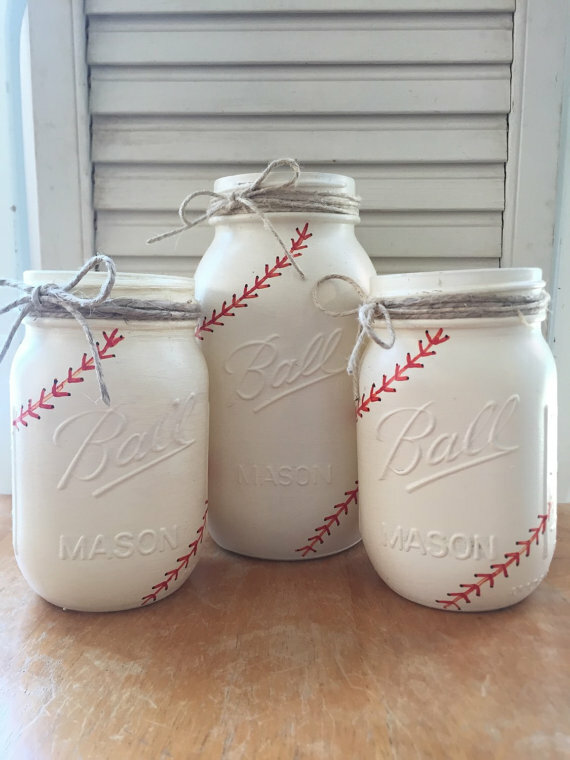 Another great idea is to gather some old mason jars and paint them completely white and then add the small detail of red lining, much like an actual baseball would have. Place candles or lollipops inside and watch how easy dressing up your Red Sox part really is! If watching the game isn’t entertainment enough, then you’ll want to have some party games to fall back on if things get a little dull. “Cups” is one that comes to mind for adults, but for younger audiences, playing ”Pin the Tail on the Opposing Team” is also a lot of fun (particularly if the Red Sox fall behind). If you have your own baseball bat, “Balance the Bat” relay races are also a good idea to get people moving as well as an egg toss game to see who has the best catching hands! Summer 2015 was certainly a beautiful couple of months in New England and although it went by way too fast, we still have one last opportunity to celebrate! Labor Day weekend is September 4th through the 7th and Boston is booming with parties and barbecues to close out the season. If you’re hosting your own event, you’re going to want to head over to your local flower shop for some beautiful décor to go along with the grilled steak tips and potato salad. Of course, we all know that different occasions call for different styles including the flowers you display on tables and decks. Adding the right vase or centerpiece to your party can add the perfect touch in making this a summer we’ll never forget! These are a few of this year’s favorites that have been organized according to the particular type of event. I love Labor Day brunches because the cuisine is delicious plus the decoration is light and airy. Most of the time, light is used as the design base and often uses blossoms that are white or soft peach and pink. The trick is to make the displays as easy breezy as possible keeping them low and dainty. Think simple and delicate like short jars of one variety like dahlias, sunflowers, cosmos, lavender or garden roses. You can mix and match if you like but make sure that there are no color combinations that fight each other instead of blending nicely. Don’t be afraid to use clippings from your herb garden too like rosemary, thyme or sage. Many of the dishes associated with brunch use these as ingredients, which make it the perfect detail to add to your floral presentation. For many of us, we show our love for mom on Mother’s Day with a beautiful bouquet of flowers, a sentimental Hallmark card or maybe even a gift certificate to her favorite spa. These great gift ideas certainly rank high for holiday presents but the number one choice still holds at taking your special lady to brunch. Boston has no shortage of fabulous restaurants with menus that include delicious cuisine fit for a queen but maybe you’re interested in another route? What if what if we put a homespun feel towards this year’s festivities? The truth is, brunches prepared by families at home are becoming more and more popular, resonating back to traditional Mother’s Day celebrations. After conducting a few comparisons, I’ve got to tell you, there are a lot of benefits tied to this new trend. For starters, there are no reservations to be made, no disappointment with ingredients or diet concerns, no traveling required and first and foremost, no excessive food charges that will skyrocket the bill. Cooking your own feast for mom does however allow flexibility within dish selection, an open door to whomever you wish to invite and the opportunity to personalize the event with your mom’s favorite foods, decorations and flowers. If you’re interested in hosting your own Mother’s Day brunch instead of dining in one of our city’s eateries, here’s a sure fire way to make all of your guests (and most importantly the guest of honor) enjoys this special day! You’re going to want to dress things up a bit since it’s Mother’s Day so plan a trip to your local florist for a fresh bunch of peonies, garden roses, lisianthus, scabiosa or French tulips. Arrange them in the center of the dining table in one of her favorite antique vases or urns and she’ll appreciate the effort to make Mother’s Day even more special with spring blooms. 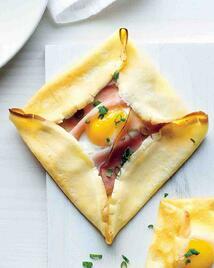 Linens don’t have to be fancy either just make sure they don’t distract from the centerpiece or the food being served. Older serving trays are perfect for this look particularly platters resonating an English appeal. Serve formally or buffet style but make sure you recruit some helpers to clean up afterwards because it’s mom’s day off! Happy Mother’s Day! 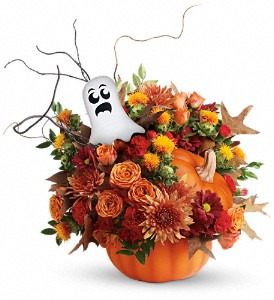 Just in time for Halloween parties in Salem, Boston and New England, Exotic Flowers in Boston has partnered with Teleflora of Los Angeles to offer the Spooky Surprise Bouquet. This festive arrangement arrives in a ceramic keepsake pumpkin and serves as a great conversation piece. The fresh arrangement features miniature roses, safflower and curly willow along with a spooky ghost. Available in Boston for same day delivery, Exotic Flowers can also send this flower arrangement nationwide. The Spooky Surprise Bouquet retails for $59.95, $74.95 (as shown) and $89.95. Members of all parties are debating whether or not the President should spend $100 million dollars on his inauguration. Of course he should. We live in the United States of America, our economy is driven by the purchasing of consumer goods and services. What better to way to show how to spend tax dollars than spending them on goods and services in America. We are a country of image. We believe in the best. We have an image to uphold and it should never be sacrficed. 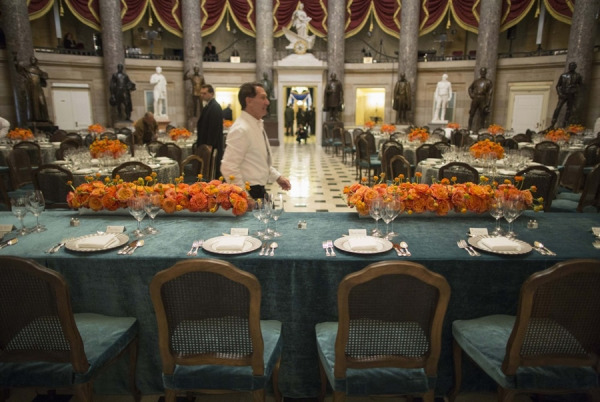 The above photo shows the flowers used in Obama's 2009 inaugural luncheon. Note the importance of flowers on the tables and also how understated and alluring the President's head table looks with three oblong flower arrangements linked together with fresh garland. Now, think about how weak and lacking these same tables would look without flowers. If you take the approach of cutting the budget on flowers, then you might as well cut the dry cleaning bill and attend the lunch in sweat pants. 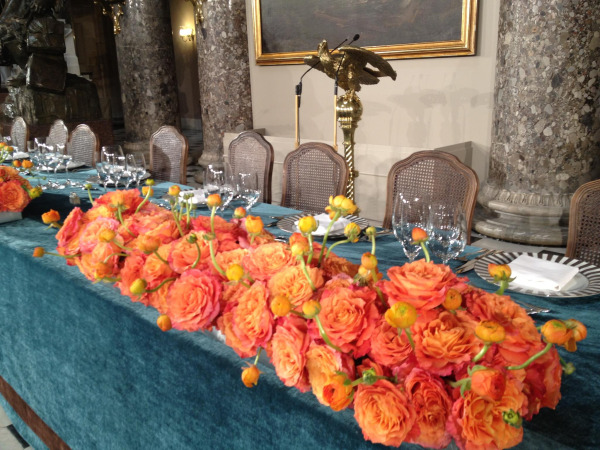 For the 2013 inaugural luncheon, party planners have chosen orange flowers in silver cache pots. While guests are dining on American favorites like grilled bison and New England chowder, they will feel welcome and invigorated by the flowers on their tables. 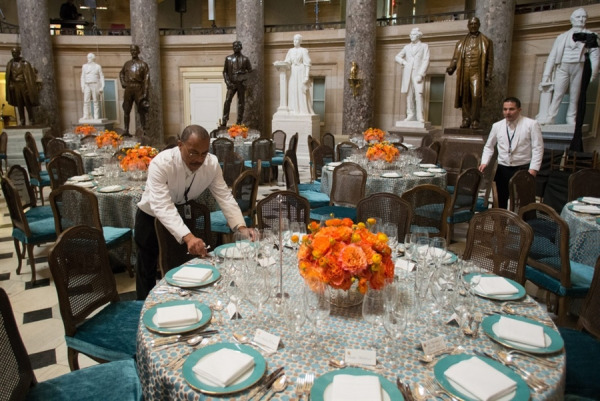 The flower colors and container were chosen to pick up the copper and bronze tones of Statuary Hall. 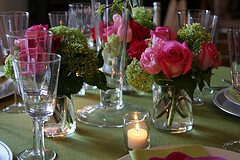 The arrangements on the tables feature 'free spirit ' roses and ranunculas. Inspired by a recent tweet from PR Maven, Kimberley Ring - Exotic Flowers presents some funky flowers for Halloween in Boston. As florists in Boston, we forget that clients need guidance on choosing flowers for their holiday parties. For Halloween, flowers choices range from blood red roses to creeping amaranthus. Some of our favorites can be seen in this post. 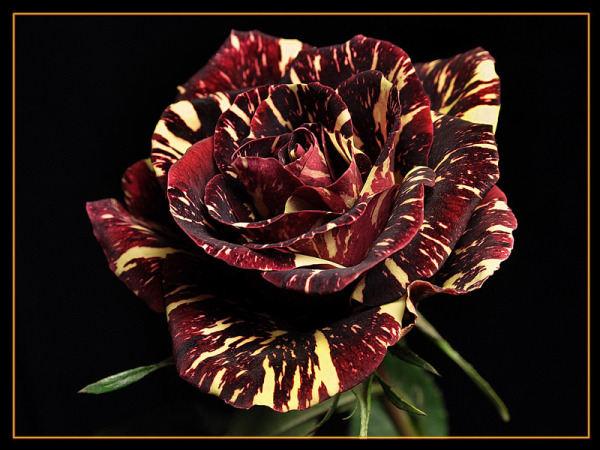 Above is the Hocus Pocus Rose, natural burgundy splashed with yellow streaks, this rose is magical. 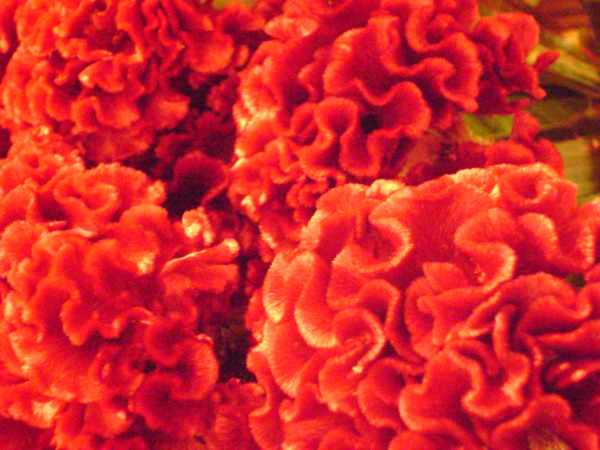 Celosia is brainlike in appearance. This cut flower comes in red, yellow, orange and green. There is no better way to create brain matter with cut flowers than clustering celosia blooms in a skull like vessel. Having a science fiction themed Halloween Party ? 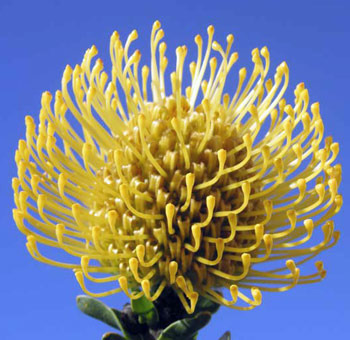 Klingons and Trekkies can both agree that pincushion protea would be an ideal flower for an interplanetary theme. Pincushion protea is readily available in orange, yellow and multi color fuzz as well. If you really want to raise the bar for your Halloween party, then check out the bat flower. A little gross and kind of scary, the bat flower is sure to be the conversation piece of your event. 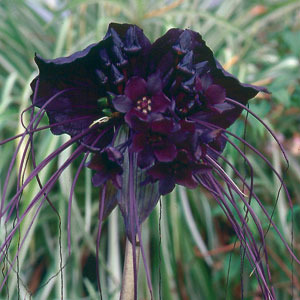 Please know that the bat flower is quite rare, so get your order in as soon as possible for Halloween. Jeanne Benedict, host of DIY Network's Weekend Entertaining, suggests placing the main floral designs in prominent places. With the extras, snip off the blossoms and float them in martini glasses or decorative bowls, and place a small vase with a couple of buds in your powder room.